Stephen Curry Makes Final Tour Stops in Paris and London | RESPECT. Following a perfect first pitch strike at the Yomiuri Giants game in Tokyo, Stephen Curry made his way to Paris and London where he spread the gospel of three-point shooting, linked up with giant judoka and fellow Under Armour athlete and Parisian, Teddy Riner, and gave a masterclass to the Lewisham-based community club, London Thunder. 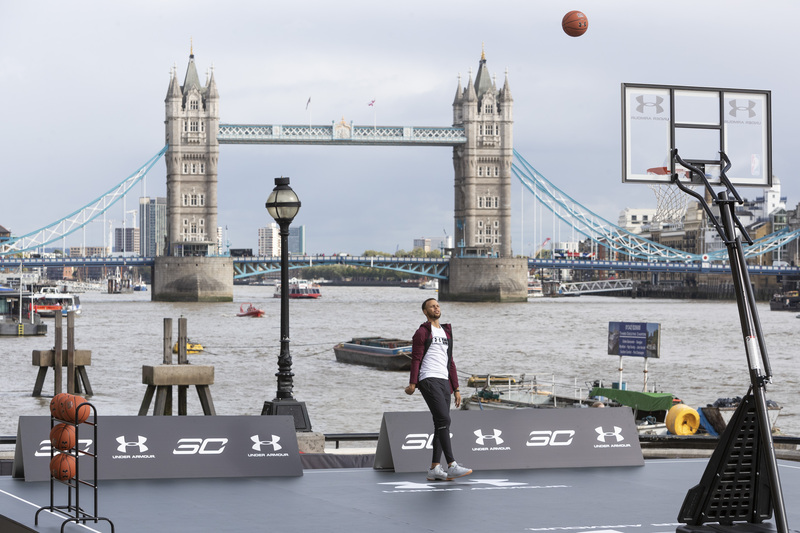 Watched on by a bustling Friday crowd and under the shadow of London landmarks Tower Bridge and the HMS Belfast, Stephen Curry provided a shooting exhibition on the banks of the River Thames as he further proved his ability to shoot threes, wherever and whenever the opportunity presents itself. Stephen was in the English capital as part of a global tour undertaken with Under Armour, designed to showcase his peerless basketball ability and will to pursue elite performance. The tour also served to showcase the release of the latest Under Armour Curry 5 colourways, the basketball shoe wired different, just like Stephen. Throughout the tour, Stephen wore different colorways of his Under Armour Curry 5 footwear including grey and red pairs. Programmed for maximum unpredictability, the lightweight, precision-fitting Curry 5 was developed to help Stephen optimize his on-court performance. New colorways have been released to celebrate Stephen’s European tour and are available at UA.com. After the visit to the Shacklewell Street courts, Stephen headed straight to the gym to train in preparation for the new season. He took no days off during his international travels with Under Armour as he prepares for training camp with his team coming up in the next two weeks.